I’ve been using an adjustable height standing desk (AKA stand-up desk) since October 2012, and I love it. I feel more energetic, and it helps me maintain better posture. I’ve been sitting only 0-5 working hours per week, and standing the remaining time. I started hearing about standing desks a couple years ago. I remember reading blog posts by local web developers, such as On Stand-Up Desks by Daniel Morrison of Collective Idea and The $40 Standup Desk by Brandon Keepers (currently working for GitHub). After a lot of searching, I found someone in Holland (Michigan) who buys height-adjustable bases with hand-cranks from Germany, attaches flat desktops to them, and sells them on Craigslist for $100. I didn’t want a flat desktop, though; I preferred the desktop from the desk I already had, which I bought at a garage sale years ago. It’s just the right size and has a nice riser (raised shelf). So, I bought the base for $90 and replaced the base on my desk. My final desk takes less than a minute to raise or lower. Several people have asked where they can buy the same desk base. Unfortunately, the person I bought it from no longer sells them, and he won’t tell me where he bought them. I can’t see any text or identifying marks on the base; it’s quite generic. Do you have a standing desk? Tell me about it in the comments. Chad – the desk looks great. And regarding the price, you’ve done extremely well! Its hard to get the base and the top for 100$. There are pros and cons to standing desks I found. The Pros – Standing gives me more energy and less headaches. I suffered badly from back pain, and I feel its not as bad anymore. The Cons – My legs always hurt after I’ve been standing for a while. I can recommend anti-fatigue mats, they did help me. Here’s the one by boss bought for me: jpofficeworkstations.com.au/ergonomic-standing-desk-electric-height-adjustable-desk-cecil/. One thing I would change is I wish I could have a bamboo top instead of the standard laminate or MDF finish. They are a sustainable material. Nextdesks do them, they are great but we don’t have them in Australia. Scott, I’ll see if he’s still selling them. Chad, I live only 30 minutes from Holland and would love to know the contact information for this guy. Curt, I just emailed you his email address. He’s moving June 1, so I don’t know if he’s still selling desks. Good luck! Could you share contact information for the person who sells the base? I’d be interested in getting one! That’s a pretty amazing price and a great looking end result, very professional compared with most DIY solutions. Chad, that’s a great standing desk! As I live in Germany, could You please give me some info about the German manufacturer of the base so I can build myself such a standing desk? Viktor, I bought the base from someone local who said it was German-made. He recently moved, but I’ll email him to ask where he bought the base. If he replies, I’ll let you know. Viktor, the person I bought the base from said he no longer sells them, and he won’t tell me where he used to buy them. I hope you’re able to find one elsewhere. What is your previous suppliers problem? If he isn’t selling them anymore, then why won’t he pass on the contact info? This was a great post right up to the point where you can’t help us do the same… lol. Are you sure the manufacturers info isn’t somewhere on your desk? Cary, I don’t know why he won’t tell me where he bought the desk base; his motive is a mystery. I haven’t been able to find any text or identifying marks anywhere on the desk base; it’s quite generic. Also, please know that my intent with this post was simply to share my experience with my standing desk, not to say, “look at this cool desk I built, but I won’t tell you how I did it.” 🙂 You’ll see that in most of my posts, I happily share details when I have them. Where did you get the $36 base and $5 topper for this great desk? I want one and so do quite a few other people by the look of it. I picked up this setup at the Hayworth store outlet in Holland Michigan. i was very lucky that at the time I walked in there they were just about to move locations and they were having a 70% off of the already seriously discounted outlet store prices. the base was brand new in the box but discounted down to $36 and the topper was a used but in excellent condition simple basic top. I think you might be able to duplicate this setup but the base will probably run you around $160 which is still a good deal for an adjustable desk. That price is way too low to be realistic market value for the manufacturing and freight that would be required to bring that product to market. Very interesting. Makes me more aware of how much I sit. It wasn’t my intent to incite envy. 🙂 When I wrote this, I just wanted to share my experience, not realizing that there was so much demand, and that people would have difficulty doing the same that I did. Thanks for sharing your product as an option. I have to agree with Ra that your source was probably stealing those bases. Everything comparable that I’ve been able to find starts at around $500 retail just for the base, which indicates a price of about $250 wholesale. There’s no way he was getting these at a price that allowed him to sell them for $90 and not lose money. Love your innovation, we just bought a pop top https://www.jasonl.com.au/collections/stand-up-desks/products/pop_top-stand-up-desk – and even though it is meant to be mobile, it is actually quite heavy and difficult to move. So I think your $90 solution is probably optimal at the end of the day! Thanks for sharing your experience, bozzza! 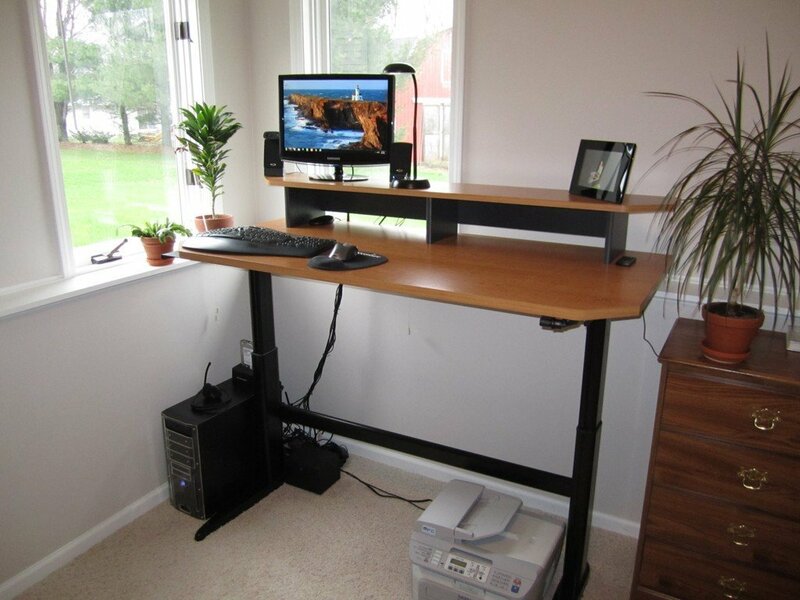 First of I want to thank you for sharing such a wonderful tips to save money just making your own standing desk himself.You did really good job Chad Warner. Thanks for the compliment, Acelin. A few seconds of googling reveals that you worked for, or still work for, Topaz Furniture. I would have preferred that you had disclosed that in your comment. Thank You for your Precious Time . Don’t knock the hustle. Also, that stand-up desk “supplier” you found… he do this kinda stuff? Frederick, my issue with Acelin’s comment wasn’t the promotion of products, it was that the comment was disingenuous. The comment made it sound like Acelin had found the company with no prior connection (“i bought my standing desk from a online furniture store”), although it seems Acelin worked for or works for that company. Disclosure would have been nice. 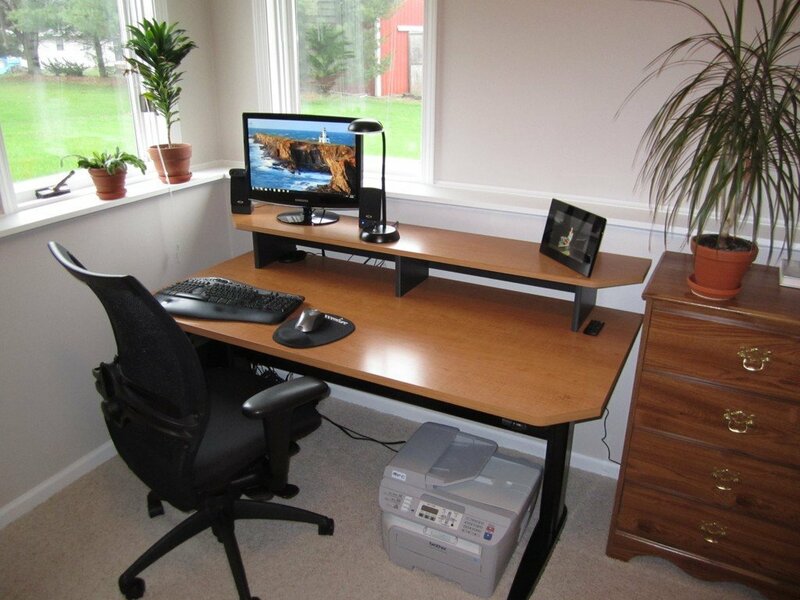 The desk base I bought in 2012 looks similar to, but not identical to, the Baker Adjustable Height Desk on Craigslist you linked to.